Want to be an armchair birder? There are many excellent bird cams broadcasting from around the world. And you do not have to watch live: many also share highlight reels so you can catch the best moments. If you are also a bird watcher at home, be sure to see this guide on How to Choose the Right Birdseed for everything you need to know to attract birds and keep them healthy and happy. 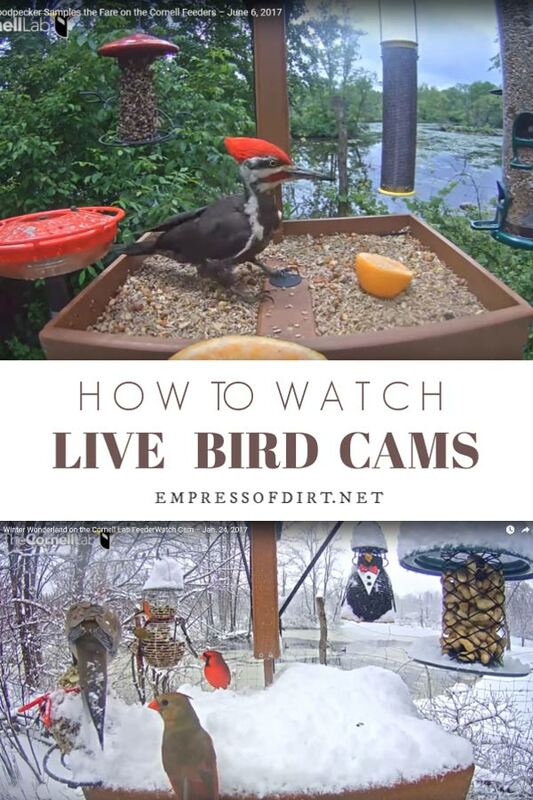 Besides keeping my own backyard birdfeeders going year-round, I also love watching bird cams (automatic cameras recording video of bird activity) from the around the world. Local bird cams let me know which migrations are arriving in my area so I can watch for them in my garden. Bird cams in far-away locations show me species I would otherwise probably never encounter. Bird cams are quite expensive to run with basic equipment, streaming, and supplies costing thousands of dollars just to get started. This is why many bird cams have sponsors to assist with the costs. But they also choose excellent locations for maximum bird-watching enjoyment. Some bird cams are placed at large feeding stations where you can see a good variety of species throught the day. There are also many seasonal nesting bird cams. Whether it’s an eagle’s nest high up in the tree tops or a view inside an owl nesting box, we get an intimate look at all of the highs and lows of life as a wild bird, and how they care for their young. It’s quite something when you happen to tune in just as the first eggs are hatching or the young ones realize there is life outside! I’ve posted some of my favourites below. The high-quality cams made for live broadcasting can be very expensive ($3000+). If you want to capture photos and videos of wildlife in your backyard, one of these moderately-priced units is a good option. I’ve owned a few different models over the years, and they have improved quite a bit since the first one I purchased. You cannot live broadcast with these cameras, but the motion sensors will (cause the camera to) take photos or video (with audio) of any activity in their range both during day and night (if the unit has a night-time sensor). The footage is stored on an SD card. Some units can transmit footage via WiFi. For others, you remove the card and upload the footage to your computer. You can then use the footage to create your own highlight reels and share them on YouTube. There are many different models depending on what you want it for. Night-vision (if you want to see nocturnal animals in your garden). Power requirements: some only take batteries, while others can be attached to an exterior electrical outlet. Good storage volume (e.g. can use 64 gb SD card). Wi-fi transmission (if you want this). Temperature toleration to suit climate (highs and lows). I love this first one because it reminds me of the best days in my own winter garden. Cardinals in the snow are so beautiful! Ever wonder how birds survive the cold without freezing? There’s several reasons. 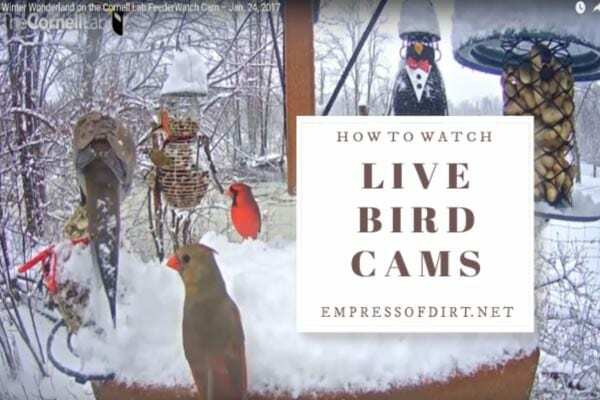 The easiest way to follow live bird cams is to subscribe to them on YouTube and hit the notification bell so you get alerts when they are broadcasting. This way you will also receive notices when highlight footage is available. Cornell Lab Bird Cams YouTube channel | Visit the page to see which cams are currently live. And, another long-time favourite is Wildlife Kate in the United Kingdom. Click here to follow Wildlife Kate on YouTube, and be sure to visit her site to see all the birds and animals that live on her property. If you have any bird cam favourites to share, let us know in the comments.